GOAL 1. 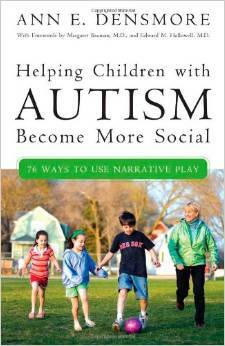 To improve the child’s ability to engage in social reciprocity with peers on the playground. The child will use appropriate eye gaze and shift his/her attention from an object to a peer in order to gain joint attention. 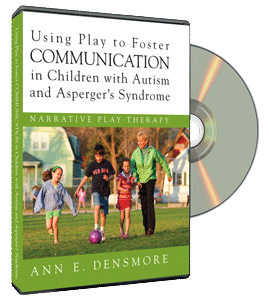 The child will comment on a peer’s action and on his/her own action during play. 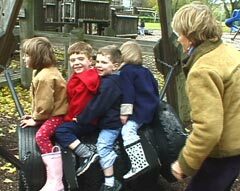 The child will initiate and join a play theme with a peer on the playground at school. The child will more consistently maintain the topic of a peer interaction or appropriately ask a peer to change the topic during play. GOAL 2. 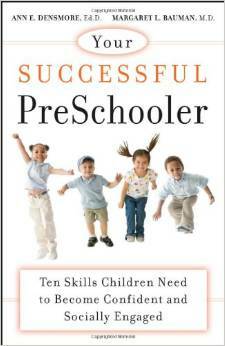 To improve the child’s social and emotional responses to his/her peers during play. The child will spontaneously comment to a peer with a compliment or point out an action that engages the peer in conversation. The child will engage a peer in telling a story theme during play (e.g., making mud soup). The child will spontaneously bring a peer into a conversation. The child will respond with appropriate emotional/facial expressions in conversation. GOAL 3. 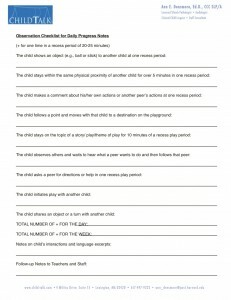 To improve the child’s awareness of peers and the behavior of others during play; to increase physical proximity during play; to follow other children on the playground; to show objects to peers; and to seek attention from peers. The child will point to peers running across the playground, comment, and then follow them with intent to join in their play. The child will more consistently stay in close physical proximity with a peer during play, make appropriate comments (e.g., I’m here! Wait for me! ), and run fast enough to “track” a peer during gross motor activities/games. The child will show a peer an object or work on a project with a peer in a story theme. The child will ask another peer to play in his/her story theme.